Information in. Problem resolution out. Seamless connector. Project archiver. Instant messenger. Exceptional performer. With capabilities like these, the KODAK Scan Station 710 has more functionality than you'd ever expect. And with its intuitive touchscreen, simple network setup, and robust remote management, it can give you an edge right out of the box. Which means the KODAK Scan Station 710 is more than a scanner. It's your new information manager. With increased ease of operation and improved file naming and security features, scanned content can be classified, organized, and searched by ad hoc users with minimal training while maintaining the degree of accessibility and security you've established. And with built-in barcode reading, data is delivered to your applications automatically. Only KODAK ALARIS offers essential services to ensure the optimal operation of your scanning solution at time of installation and beyond. KODAK Scan Station 710 service plans, such as Startup Assistance and Network Scanner Training, put KODAK ALARIS knowledge to work for you. Plus, access to our Help Desk and product experts, along with the latest product improvements, will allow the KODAK Scan Station 710 to satisfy your evolving business process needs for years to come. Usage: Increase productivity with our keyboard accessory kit that makes it easier, faster, and more comfortable for you to type. 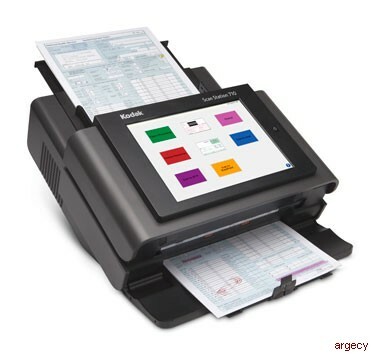 The optional keyboard is smaller than a standard PC keyboard and can be attached to the Scan Station 700 series scanners to enter email addresses or for easy data entry. Includes: KODAK A4 / Legal Size Flatbed with white background, 2-meter (6-ft.) USB cable and power supply. Includes: KODAK A3 Flatbed with black background, 2-meter (6-ft.) USB cable and power supply.